Breakfast for Dinner (or for Breakfast): Brioche French Toast w/ Local Bacon — Happy Food Co.
★SLICE vanilla bean in half with sharp paring knife on cutting board and scrape out seeds. HEAT milk, cream, cinnamon stick, orange peel, vanilla bean and seeds in a medium stock pot over medium-high heat. SIMMER until mixture comes to a boil, about 5 minutes. REMOVE from heat and strain into 4 cup liquid measuring cup, discarding vanilla bean pod, orange peel and cinnamon stick. 1. With a sharp paring knife, cut down the center of the vanilla bean, trying not to slice completely through the pod. 2. Peel the sides of the pod outward and run the side of the knife down the pod to scrape out the tiny, sticky vanilla seeds. SPRAY 3 quart baking dish with non-stick spray and lay bread slices flat in dish. 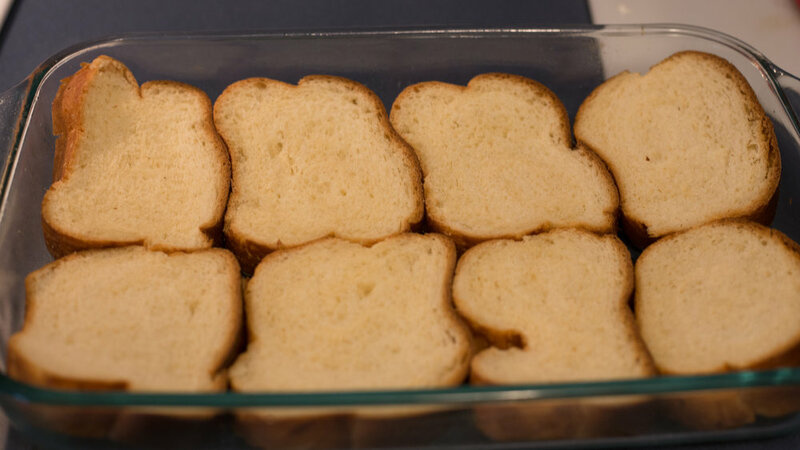 POUR mixture over bread, covering fully. 3. OVEN TIME, SERVE & ENJOY! ARRANGE bacon on baking sheet and place on top rack. PLACE baking dish on middle rack of oven to cook simultaneously with bacon. BAKE at 375 degrees for 20 minutes or until custard is set and golden brown. SERVE french toast with desired amount of butter, powdered sugar and maple syrup, along with bacon on the side. ENJOY with a Bloody Mary! See Chef K’s recipe below! Filtered three times and 5-times distilled from the finest grains, this 80-proof vodka is so smooth you can create a perfect cocktail or drink it straight. Accompanying a simple malt base, blueberry, raspberry and tart cherry play in perfect harmony to create a slightly tart ale that sings with ripe, bursting fruit flavor.